Looking for a customer built computer with any of these parts, or even higher end performance parts? Give us a call and we can customize a computer for your needs! Have you infected your computer in the past? The process of removing it can be costly and frustrating. Here are some tips to make sure you avoid viruses and parasites in the future! When searching, watch out for advertisements! When you search for something, be sure you are going to the intended web site. In the image above, anything in the green area is safe. Links in the red areas are not always bad, but depending on the search, can lead web sites that have parasites. For example, if you search for Starbucks, their web site will normally be first in the green section. You may notice one of the ads will say starbucks.8m.com, or similar, which may take you to a junk web site. If someone sends you a link randomly, use caution! This is a sign of an e-mail address that has been hacked. If you aren’t expecting a link from the person, don’t click on it! If you aren’t sure, call them! These links almost always lead to a virus. Luckily, even basic antivirus programs catch most of these scams. If you are looking for news, for example, go to cnn.com and don’t click on any associated links. Normally big web sites like these are fine. However, going to smaller blog style web sites to get your news might put you at risk for more parasites. Using these tips can help you avoid parasites in the future. If you ever have a question about a specific web site, or if your machine has become infected, feel free to give us a call! We are happy to help. The weather in Colorado is wild: protect your electronics! You’ve seen it: bright, blue skies. 30 minutes later, black skies and tornado sires. While you think that the weather can only damage things like your house or your car, don’t forget about your electronics! Your 15 year old surge strip isn’t doing its job! Look at your surge strip! Electricians suggest replacing surge strips once a year, even if they say they are protecting your equipment and even if the weather has been fine. A surge strip will absorb a certain amount of power (called Joules). So, a 1000 joule protector will protect your equipment better compared to a lesser rating. Your equipment is expensive to replace! A surge may not damage just simple components. For example, a surge that gets to a computer can take out your power supply, your motherboard, and more expensive components. There are a lot of power strips out there that don’t offer protection. These are no better than plugging the equipment directly into the wall. Don’t trust them to protect your equipment! Have questions about protecting your equipment? Feel free to come in any time and talk with us! $10 laptop adapters online – be careful! A phrase I wish I never had to hear again – but a phrase that I understand. Why spend twice the price on something that appears to do the same thing as a cheaper alternative? We found the results frightening. This was on another forum I came across. The person asked why their battery popped out of their tablet over night. The answer: third party charger or cord. While a charger cord will plug in the same and charge the same, they may not always charge the battery the same way. 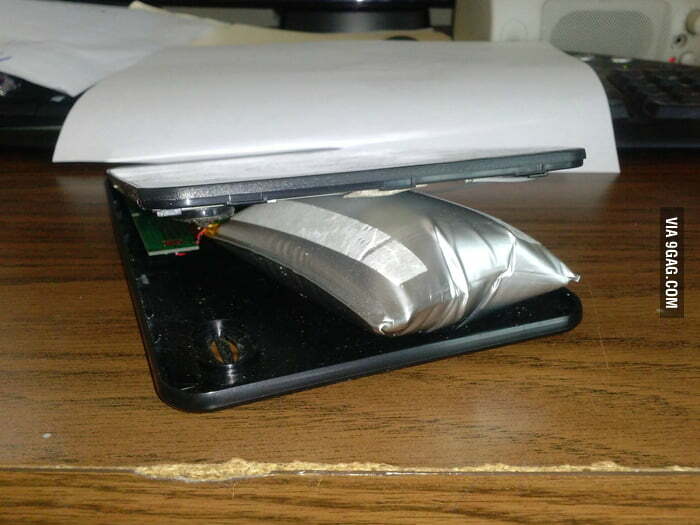 This can cause damage to the battery or the device. The problem with AC adapters, cables or batteries that are not genuine products is that they are not made the same way. Most of them are made in factories by workers who should never be dealing with electronics. Also, they don’t go through the same testing (UL certifications) as an original adapter would. We carry genuine AC adapters for used prices. Don’t worry about buying a dangerous product that may cause you or your machine harm! Even if we don’t have an exact match for your computer or device, we carry branded alternatives that we have heavily tested and trust. Yes, they may not be the cheapest option – but they are going to last! You’ve seen them in your Facebook feed, on TV, on fliers and pretty much everywhere. What you and I at one point called a number sign or pound sign has been renamed completely and is used in a different way. So, before you go out and make the mistake of using these classic words, only to find a confused look on the face of the person you’re speaking to, read this tutorial! WHAT IS A HASHTAG, AND WHERE DID IT COME FROM? The modern day use of the hashtag became popular on Twitter. Before that it was used on IRC to label groups and topics. The first hashtag was used in 2007 on Twitter. Beginning July 2, 2009, Twitter began to hyperlink all hashtags in tweets to Twitter search results for the hashtagged word. In 2010, Twitter introduced trending topics on the Twitter front page, displaying hashtags that are rapidly becoming popular. In this situation, using this hashtag will put your post with everyone else that uses that tag that thinks the penalty was bad. If there a lot of people that use the same tag, it becomes a “trending” topic, or a hot topic. Then, it often catches the attention of people and it will spark a lot of discussion. Clicking on a hashtagged word in any message shows you all other Tweets marked with that keyword. When you are posting a hashtag from an account that can show publicly, anyone who searches for that hashtag will see your post. Twitter suggests using no more than #two #hashtags per post (your Instagram friends may not know that). Hashtags can be used on most social networking sites, like Twitter, Facebook, Instagram and Pinterest. Most have now integrated them into their systems too, so you can click on a hashtag to see other users posts. Use a hashtag for a wedding. Any of your guests can use a cute hash tag, like #theMartins2015 so the wedding party and guests can see everyone’s pictures. Also, creative ideas like a favorite recipe, use the hashtag #dinnertime so others can see the picture of what you’re cooking. Maybe you want to start a trending hashtag (now that you know what that means). Put your finger in ice cold water for 10 minutes and use the hashtag #myfingeriscold. Maybe millions of other people will do the same. Not that we’d suggest that! How do you determine the actual speed of a computer? A benchmark! But what IS a benchmark? Have you ever wondered what makes a computer fast? If you buy a computer with a decent processor, you are solving most of the problem. But that’s not the only part that you need to be concerned about! Your processor works together with other components to make your computer runs quickly. For example, if you have a slow, under powered hard drive. your overall system performance will go down. Same goes with RAM and graphics. A benchmark utility will test each individual component and give each an individual score. That score gets added up and becomes your benchmark score! The test will show you where you need to put your money to upgrade your computer to get more performance. Once the score gets high enough, you will need to upgrade the system completely to gain more performance. This test is especially useful when trying to compare the speeds of different computers, or doing a before and after when doing upgrades. Action Computers uses benchmark scores to assist the customers in picking the correct computer for their needs! Think running dual monitors is expensive or hard to set up? Think again! Running 2 monitors on your laptop or desktop is very easy and affordable to set up. Once you have 2 monitors.. you will never go back! In a world of multitasking, dual monitors is almost a necessity. Users running several applications often find the convenience of having two monitors a more beneficial upgrade to their computer than adding more memory or hard drive space. And, since the prices of flat screen monitors have came down in price, you can get a decent flat screen set up for less than you think! Ready to go dual? Check to see if your computer is ready. Some connections above may need converters to run certain monitors. Your salesperson will be happy to show you the different options. Normally a converter cable costs less than $20. Need an extra connection(s)? No problem! If you only have one video output above, you will need to add a part to run 2 monitors. Luckily, this can be easier than you think! We can add a graphics card into the machine, starting as low as $42.99, that has the connections you need for dual monitors. Alternatively, if you don’t want to bring your computer in for service, a USB video adapter is an easy addition to your computer that simply plugs into a port. These are only $42.99! We sell a variety of LCD monitors starting as low as $19.99 that will work perfectly as dual displays! Want to go large? We carry up to 27″ monitors on hand and can order any larger size you need! Dual monitor packages start as low as $79.99! Add a second monitor to your computer today! Don’t be tricked into buying an “inexpensive” new machine, thinking your getting a good deal because of the price! Big box computer retailers bring customers in to their stores by offering low priced, low quality affordable hardware. While it would appear you’re getting a deal, the slow processor will make your computer experience miserable. Don’t fall for it! Our entry level computer scored better than a competitors machine that is BRAND NEW! That means you will notice a speed improvement resulting in web pages loading faster and less waiting for programs to load which means you will be more productive! Quality, high speed desktop computers starting as low as $239.99! A revolutionary way to clean your keyboard for $10.99! Check out this new solution, only available at Action Computers! Introducing keyboard slime – put it on top of your keyboard, and it cleans! Use it on your desktop, laptop or tablet keyboard, as well as other devices that could use some cleaning. Check out the pictures below! Here is a dirty keyboard! And now it’s clean! Much easier than cleaning solutions and about a quarter of the time needed!